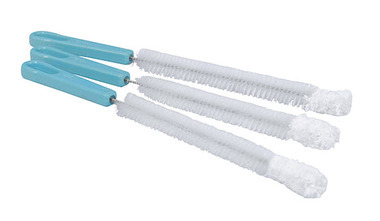 The Optibrush Plus cannula-cleaning brush with fibre top is an addition to our range. The Optibrush® Plus cannula-cleaning brush with fibre top is an addition to our range. It features an extremely flexible wire netting and has sturdy, soft nylon bristles that extend from the tip of the brush to the handle, as usual in our Optibrush® cannula-cleaning brushes. The main feature of the newest version of our Optibrush® cannula-cleaning brushes is the brush tip, which is surrounded by a fibre top. 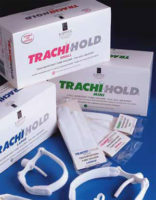 The fibre top is especially wipe-active and its absorbent fabric fibres ensure effective and gentle cannula cleaning. The Optibrush® Plus cannula-cleaning brushes with fibre top are available in ten different sizes, with diameters from 5mm to 14mm at the brush area. The core of the Optibrush® Plus cannula-cleaning brush with fibre top, made of stainless steel wire, can be individually adapted to the tracheostomy tube, which makes the cleaning process substantially easier. Damage or scratching of the sensitive cannula material can be largely avoided using the Optibrush® Plus cannula-cleaning brush with fibre top. In spite of this, you should continue to take great care in the handling of tracheostomy tubes, especially during the cleaning process. Because of this, you should always attempt to remove debris from your cannula with our special cannula-cleaning powder, within a wetcleaning process. 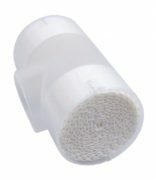 Mechanical cleaning with the brush should always be the second option, as they place greater strain on the cannula material than a cleaning solution. Should additional cleaning with the cannula-cleaning brush become necessary, please note that the cannula-cleaning brush should always be inserted from the cannula tip, into the tube. Little force should be used during the cleaning process itself.